“Paul and Elsa have helped us out with all kinds of stuff over the last 6 months including visa applications, business registrations, drivers licences, a motor vehicle purchase and document notarizing just to name a few. We have found them to be honest and easy to deal with every step of the way Their service saves you a helluva lot of time and heartache in trying to get through the bloated bureaucracy so loved by Filipinos. We recommend Paul and Elsa to anyone we speak with and will be using their services again soon. You should too! We were very happy with the way you organized our wedding. All the financial things were very transparent and we felt good and cared for throughout the event and during the whole time of preparation. All our ideas where taken care of, and maybe even more important: the things were we didn’t really have an idea were all done good as well. If we had to do it again we wouldn’t change a single thing, except maybe take a bigger package (more people) at the resort. Because even though there didn’t really seem to be a problem with unwanted guests, somehow there were a few more than planned in the end anyway. 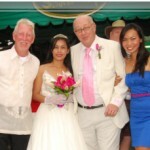 Our Wedding in the Philippines. Towards the last part of January after completing the seminar and having applied for the license Jhean asked if we could get married on Valentines and I decide that although time was short we would give it our best shot. I had already talked with Paul & Elsa (He is a Brit with Aussy Nationality now)about there participation having nothing but good experiences with my visa extensions and various help when we needed it paying money into a specific bank not available here in the Province for our on-line N.S.O applications. Having been involved in Event organisation for 25 years I know how important it is to have good local knowledge and to find some-one to hold the energy of the day especially since I wanted to be completely free to enjoy Our Big Day. They agreed to be our planners and Im so glad that they did. We met at there home at the end of Jan and discussed what we needed and we ordered the invites having looked at some examples of previous weddings the most difficult from my point of view was selecting the Venue as I knew I wanted it to be outside but with shelter in case of rain but at the same time a feeling of privacy and I looked at about 5 before deciding on their recommendation,which ticked the majority of my boxes not least of which was my budget for around 65 guests Total costs 82000 peso plus rings Hotel and transport if you doubled the guests I would expect it to add another 30000 or so. They took us to a bake shop near there home where we picked and ordered the cake and then Elsa arranged to meet with Jhean at the Dress Shop they recommend in Mandaue to pick Her Dress and the Rest of the Entourage. They additionally produced our invitations to our specs The guest list , our coloured stickers to identify our party and the Beer tickets I wanted to distribute to our guests They organised the Photographer who was great. The Flower Arranger beautifully done Additional décor, Seating, Props and P.A. The Music for the day And most important A Baptist Minister who could Marry us there at the Venue. 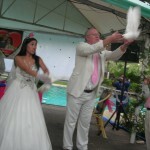 Doves for us to release. And of course liason with the Venue, Catering and Lechon. This meant I could relax and not have to run backwards and forwards to Cebu. On the Day they were there at the Venue early to make sure all went as planned all was ready when I arrived and they managed both the ceremony with its grand entrances and after, the Reception with Paul as M.C. Seamlessly and with Grace and Humour.